Who doesn’t love pizza? Seriously. Show yourself and be shamed! We’re kidding, of course. But it’s really hard to find someone who thinks a zesty sauce topped by gooey cheese, mountains of meats and voluminous veggies (if that’s your bag) isn’t the best thing this side of heaven. In fact, a not-insignificant percentage of the world’s gourmands consider pizza — with its almost endless varieties of preparation — to be their favorite food of all! What’s more, pizza has a long and storied history that may surprise you. So preheat that oven, and dig into National Pizza Month this October! ​Indiana pizza shop owner Gerry Durnell published a magazine called "Pizza Today" and declared October as National Pizza Month. America got its first pizzeria when Lombardi's opened a joint on Spring Street in Manhattan. It's still there. ​​The word "pizza" first appears in a Latin text written by someone in what is now central Italy. The ancient Greeks were known to bake bread, dunk it in oil, then top it with herbs and cheese. Humans have been using toppings to flavor baked bread since the Neolithic Age, which spans many thousands of years, beginning about 10,000 BC. Pizza is fun to eat and to share. So why not share in the fun of making one together with family or friends? It will be fresh and tasty — and right out of the oven! They work hard to get our pizzas to us fast, fresh and delicious. If you open the box and the cheese is still a-bubblin,' then be sure to give the delivery person a solid tip for the swift and stellar service. One of America's most cherished traditions is going out for pizza with the kids' sports team. Your local pizza place will appreciate it, and the kids will have a good ol' time! ​According to Pizza.com, 94 percent of Americans eat pizza at least once a month. That adds up to about 45 slices per person per year. ​In 2009, Mamma Mia! Pizza Kitchen in Levelland, Texas, created a Rattlesnake Pizza in honor of National Pizza Month. The world's largest pizza was baked in 2012 in Rome, Italy. It measured 13,570 square feet. ​Nino's Bellissima pizzeria in New York City is known for selling a caviar pizza that costs $1,000. 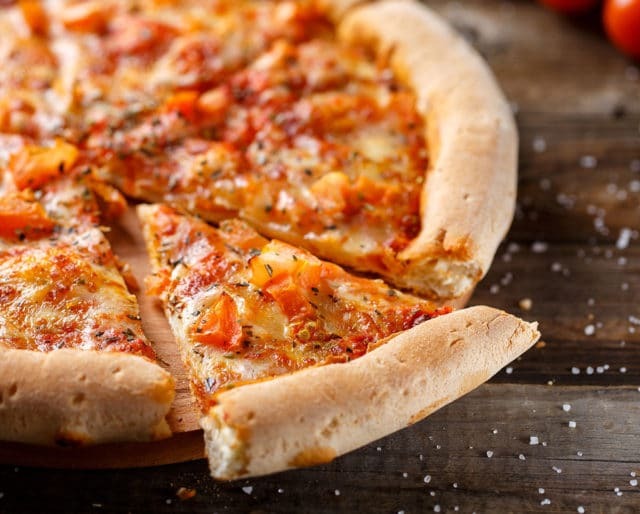 A survey released by California Pizza Kitchen found that 20 percent of Americans would choose pizza if they were forced to eat just one food for the rest of their lives. Few foods offer the kind of delectable dining experience as pizza. Keep your fancy-schmancy restaurants with their hoity-toity menus. Give us a real treat — a melty slice of hot, cheesy pizza! One of the great things about pizza culture is that it inspires competition. Every town from Cheyenne to Cherbourg has a whole host of pizza joints. There's something for everybody! Unlike other dining experiences in which people order different things form the menu, pizza dining requires cooperation. Pepperoni or pineapple? Extra mozzarella or a thin layer of Parmesan and Romano? Let's vote. Then let's eat!